An odd headline, isn't it? Well, maybe for most people. However, the people who stayed with me in Cabin 8 at band camp this year know exactly what it means. You see, we have a new director this year, Mr. Chris Dearbeck. A 2000 graduate of Girard himself, he was a saxophonist in the marching band throughout high school. Each year through college he wrote our drill and was assistant director. When our previous director finally retired, he got the job. Mr. Dearbeck has always been the kind of person who enjoys a good, harmless prank. If I'm getting the story right, he once was involved in duct-taping a chair to the roof of a cabin at band camp. That got a little messy under the sun, and since then, the use of duct tape has been severely limited at camp. Needless to say, when we realized that the last day of band camp this year was going to fall on Mr. Dearbeck's birthday, we knew we had to do something. Ideas were thrown around each night. It was obvious that it was going to be done in the middle of the night, when no one would see it. As a drum major, however, it was my responsibility to make sure they didn't decide to do anything too drastic. Finally, the night before, it was decided that we would all get up at 02:30 and take all the small wooden chairs off of all the camp's porches and place them on the front porch of Cabin 9, which would essentially lock Mr. Dearbeck inside his cabin were it not for the back door. 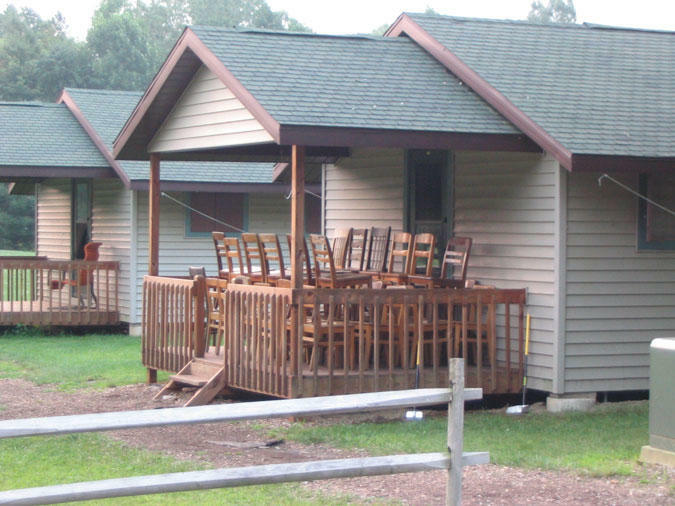 In addition, large, comfortable orange chairs can be found on the porches of Cabins 9 and 10 (you can see one in the background of the picture below on the porch of Cabin 10). We had decided that we should take the orange chairs back to our own cabin and get up at 06:00 to wait on our porch for Mr. Dearbeck to come over and say something. I suggested some sort of assembly line to make things go quicker, because I have had many a night of insomnia at camps, and I know that 02:30 is not when people sleep their heaviest. We all went to bed, and once 02:30 rolled around, the person in charge of the alarm slept through it. I awakened once again at around 05:15, at which time I set my alarm clock to go off at a later time. It made a little confirmation beep, ensuring me that it was, in fact, set. This slight noise awoke some of the others in the cabin, who woke up the rest, and to work we went. The assembly line worked almost extremely well. 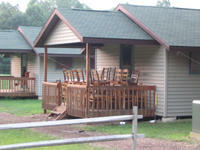 From 05:20 to 05:40, four of us removed chairs from the porches of Cabins 1 through 8 and took them across the gravel road (which was hard to do quietly), while two stayed back at Cabin 9 and began putting them up on the porch. By 05:45, we had forty chairs stacked on the front porch, with four left over. We quickly decided to put them just outside the back door, so that once Mr. Dearbeck resorted to the back door he would find another surprise, but not so much of one that it would be a fire hazard (always thinking ahead). It was nice getting up at 05:15 to do this, because we could just sit around and wait for Mr. Dearbeck then. There was no need to go back to bed and wake up to a second alarm. Around 07:20, Mr. Dearbeck finally came over. The first words out of his mouth had nothing to do with assigning us laps, or making us take the chairs down later. He simply said, "I'm impressed." The prank was flawlessly executed, and the director, who himself would have done something similar, was there to commend us. Forty-four small wooden chairs were given in exchange for six large comfortable ones. I have now made 44 my second luckiest number. What is my luckiest number? Twenty-three, the age Mr. Dearbeck reached that very morning. Wow...that's a lot of chairs! Our pranks are more limited to placing spongebob and E.T. dolls on the ladder and stuff like that. HA! I like your Driver's License Progress meter. I got my hours by just driving my parents everywhere they needed to go. that's really neat. the driving thing. i'm glad you've posted twice in the same week! and the chair prank sounded like so much fun! i wish i was good at pranks. I was acually @ Band Camp so I got a first-hand experience of Fourty-Four Chairs. It's quite strange waking up on the last day of Band Camp (all the girls would sit out on the porch and watch our Drumline leader walk around in his boxers)we go outside and, no chairs. Instead we see TJ, Charlie, Justin, Patrick, John, and Will sitting outiside their cabin in the plush chairs from Dearbeck's cabin, and looking very triumphant. The rest of our last was filled with... a rainstorm, a tornado watch, Dearbeck in the Gauntlet, performing for our parents, a stolen Dauchsand named Slinky, a breakup, a fling, and everyone crying! I myself included. PS - Watch out for rabid groundhogs while in Punxy!